Series exploring the world of food. Dan Saladino heads to rural Tennessee to meet teacher, writer and fermentation revivalist Sandor Katz. Sandor Katz has been enchanted by fermentation, the mysterious process by which microbes transform food and drink, for some two decades. 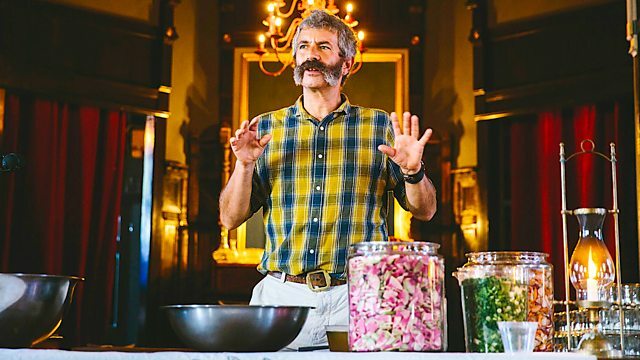 Since making his first crock of sauerkraut, his fascination with fermentation has broadened, deepened, and he now travels the world giving workshops. Based in Tennessee, his books including 'Wild Fermentation' and the encyclopaedic 'The Art of Fermentation' have helped many thousands of people to get started with making their own ferments, experimenting with flavours, fruits, vegetables, spices... and microorganisms. Dan Saladino travels to Sandor's forest home in rural Tennessee to meet Sandor, hear his story, and discover for himself the transformative, delicious potential of these mostly simple culinary processes. Hunting With The Hadza 2: The Microbiome. Greece: Return to the land?